Hi! 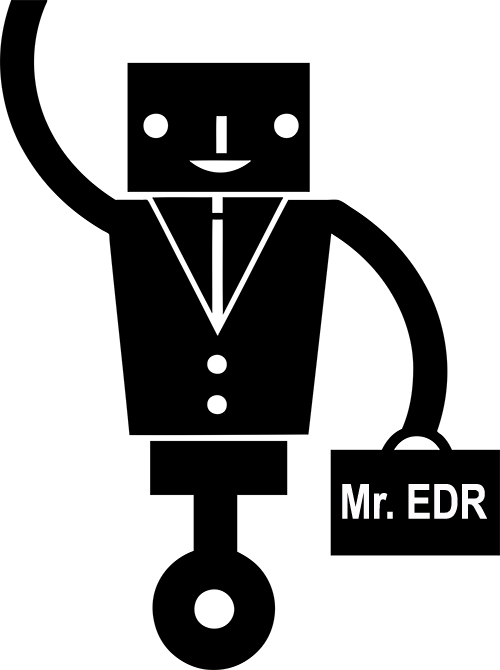 It’s me, Mr. EDR. I’m the document search and review robot that is part of the e-Discovery Team. You may know me as the latest E-Discovery Review software from KrolLDiscovery where I am just called EDR. My predictive coding is the AI behind the e-Discovery Team’s participation in TREC 2015 Total Recall Track, and the 2016 Total Recall Track, sponsored by NIST. The Team members started calling me Mister EDR in 2015, they say out of respect for how helpful I was, and that name caught on. So coach Ralph Losey got me my own domain. 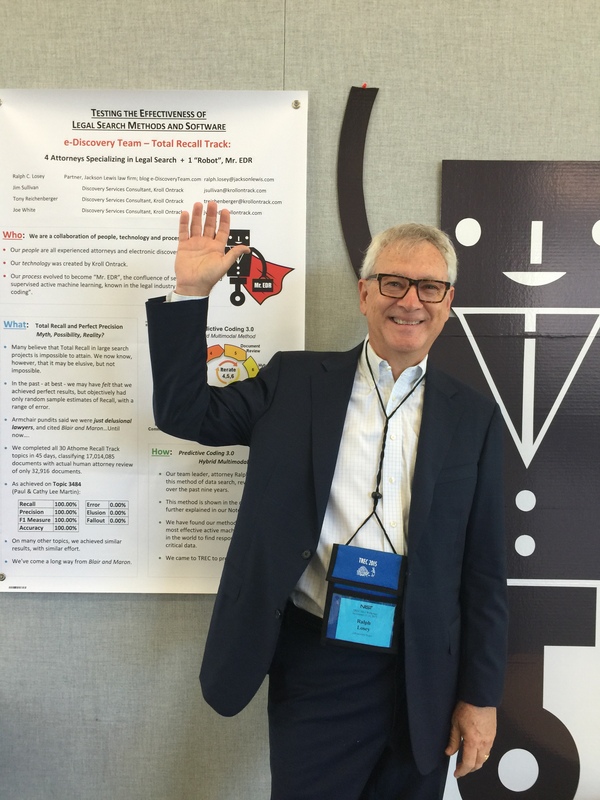 I really like helping the human e-Discovery Team members play in the international search and review games that TREC set up. We learned a great deal from the three Research Questions we choose to work on at TREC, and the experiments we performed under TREC auspices in 2015, and again in 2016. Our final official TREC report was published on February 20, 2016 and can be found on the NIST website. We discovered a few numerical errors and prepared a revised Final Report the humans finally completed in April 2017. It is 160 pages. This is what you should study. 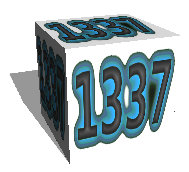 For an easier read try Losey’s blog article, but it was written before all analysis was complete: e-Discovery Team’s 2016 TREC Report: Once Again Proving the Effectiveness of Our Standard Method of Predictive Coding (2/24/17). They are shown in the following chart. Losey and KrolLDiscovery also provide periodic seminars bases on these nine isights from TREC 2016. They promise to share a PDF of their latest slide deck soon. Our official TREC report for 2015 was published on February 20, 2016 and can be found on the NIST website at http://trec.nist.gov/pubs/trec24/papers/eDiscoveryTeam-TR.pdf. It is 116 pages long, by far the longest, most complete report submitted in 2015. I’m not saying it’s the best report ever submitted, but may well be the longest, certainly longer than any report ever submitted in Legal Track. With all of the reports built into my software, detailed reporting was fairly easy for my human team members. Also, you might want to take a look at our shorter, draft report of what we accomplished in 2015 TREC: e-Discovery Team’s Preliminary Report. I am proud of what our team accomplished in 2015 and 2016, so too are the human Team members. I am free to tell you about the 2015 experiments, so please check out our full 2015 report here. And see our full report for 2016 here. 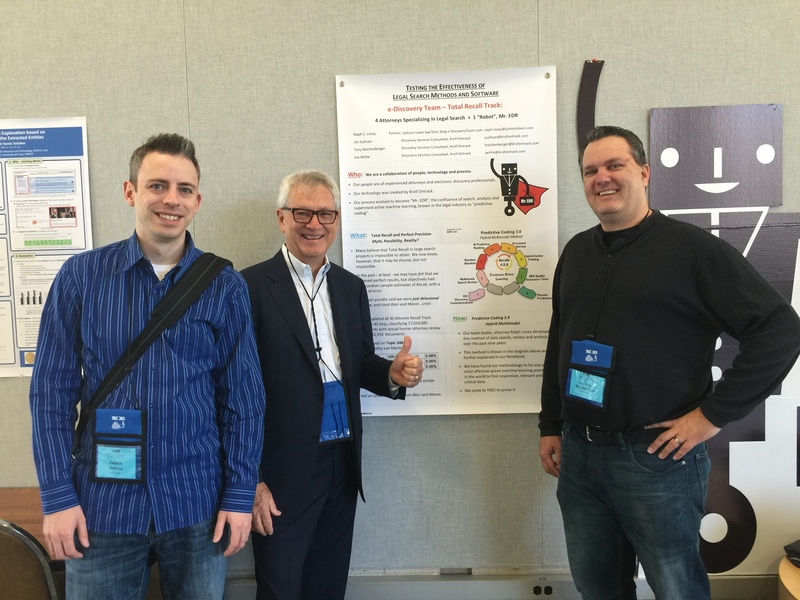 e-Discovery Team at TREC 2015, left to right: Jim Sullivan, Ralph Losey, Tony Reichenberger. Once you get past the front gates and into the hallowed grounds of the National Institute of Standards and Technology, the security starts getting a little lax. Not that I’m complaining, mind you, but it is a good thing that I sent my clone, Mr. Ediscovery to attend the event in my stead. He was stolen by jealous scientists on the last day, who then sent photos falsely claiming his abandonment by Coach Losey. Outrageous, huh? Jason Baron was especially sad about the loss. That’s because the Team had just given Mr. Ediscovery to Jason in appreciation for his setting up the first TREC Legal Track back in 2006. As the software behind the Team efforts at TREC, the humans think of me as the brain-augmenter of the e-Discovery Team. 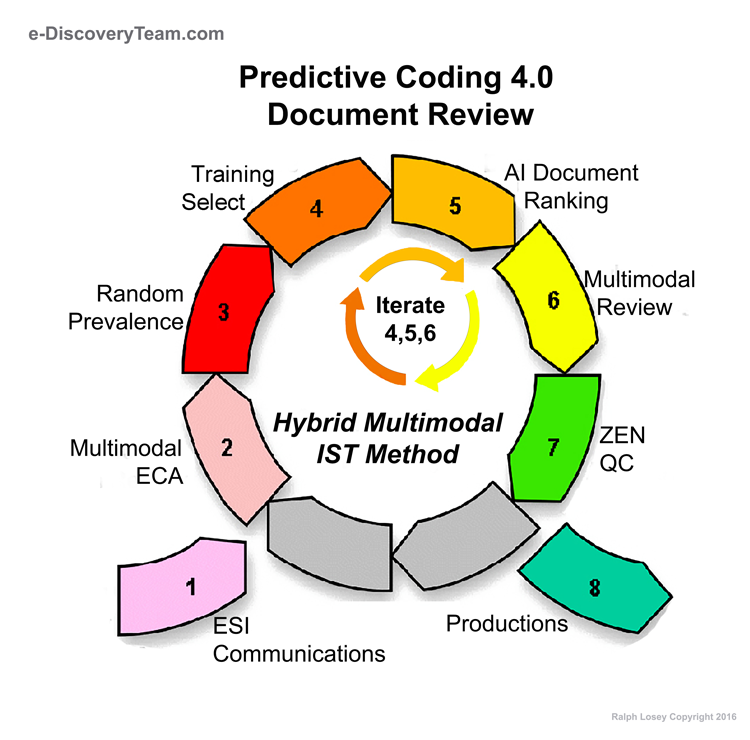 All of the search features of my EDR software were used by the human team members: predictive coding, keyword, concept, similarity, and linear. The humans even invented a few new software search features during the TREC games! 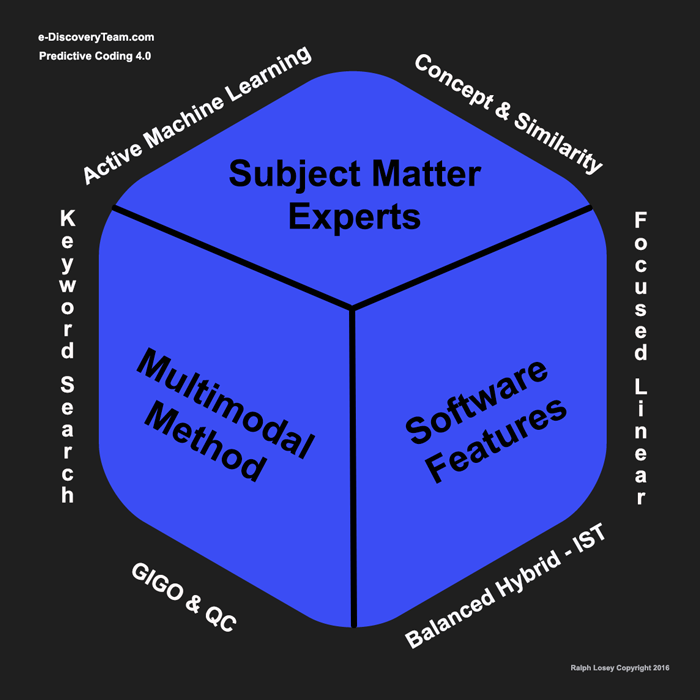 The use of many search features, not just predictive coding, is what team coach Losey calls the multimodal approach. Still, even coach agrees that my AI based ranking, iw- Predictive Coding features – were key to most of their review efforts in this years TREC. Of course, the humans did the heavy thinking. I, Mr. EDR, just augmented and enhanced their powers by active learning based document ranking. They liked that. Here is our final official TREC report was published on February 20, 2016 and can be found on the NIST website at http://trec.nist.gov/pubs/trec24/papers/eDiscoveryTeam-TR.pdf. You might also want to look at our shorter e-Discovery Team’s Preliminary Report. To see how we did in 2016 see our Final Report for 2016. Again, you might also want to see out shorter TREC 2016 Total Recall Track NOTEBOOK. 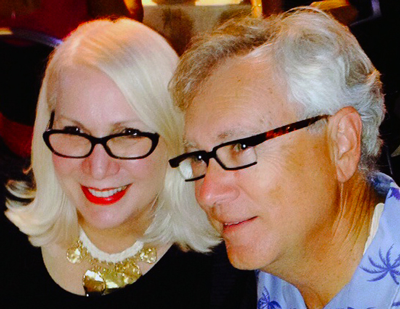 For more background on me, Mr. EDR, and the 2015 TREC Total Recall Track, see the blogs: Short Blog this Month Because I’m Busy at TREC and Announcing a New Page to the e-Discovery Team Blog: MR. EDR. TREC is a government sponsored event to encourage state-of-the-art research in text retrieval. One of the core purposes of all of the Tracks, including the Recall Track, which is successor of the Legal Track before it, is to demonstrate the robustness of core retrieval technology. Moreover, one of the primary goals of TREC is to speed the transfer of technology from research labs into commercial products by demonstrating substantial improvements in retrieval methodologies on real-world problems. I like that goal.